Find answers and general information quickly about the workflows tool in HubSpot. What happens to objects in a workflow when it is turned off? Why aren't existing objects that meet a workflow's enrollment triggers being enrolled in the workflow when it is turned on? Why aren't previously enrolled objects that meet a workflow's enrollment triggers again being re-enrolled in the workflow? Why are my workflow actions not executing at the expected time? What happens to objects in a workflow when I add more workflow actions? Why is the rotate leads action in my workflow delayed for 10 minutes for new contacts? What happens to objects waiting in a workflow delay when the delay is deleted? What happens to objects waiting in a workflow delay when the delay timing is changed? When a workflow is turned off, objects that meet the enrollment triggers will not be enrolled in the workflow. Active objects in the workflow will still continue through the workflow, but any actions apart from delays will not be executed. Learn more about the impact on objects in a workflow that is turned off. By default, objects will only be enrolled in a workflow if they meet the workflow's enrollment triggers after the workflow is turned on. Learn how to enroll existing contacts who meet the enrollment triggers in contact-based workflows, and enroll existing objects that meet the enrollment triggers in company-based, deal-based, ticket-based, or quote-based workflows. 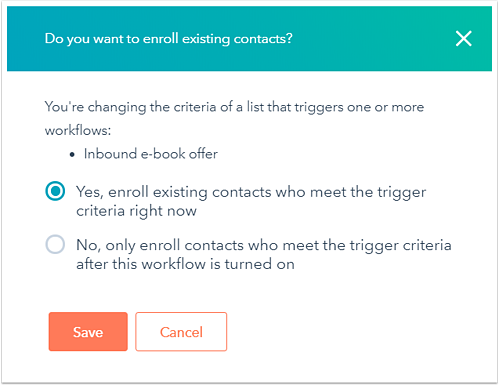 When you change the enrollment triggers in an active company-based, deal-based, ticket-based, or quote-based workflow, a dialog box will appear for you to choose to immediately enroll any existing objects that meet the updated enrollment triggers. By default, objects are only enrolled in workflows the first time they meet the workflow enrollment triggers or are enrolled manually. Learn how to add re-enrollment triggers to allow objects to be re-enrolled in a workflow. When you edit the filters in an active list used in an active workflow's enrollment triggers, then attempt to save the list, a dialog box will appear for you to choose if existing contacts that meet the newly updated list criteria should be immediately enrolled in the workflow. When a large number of objects are being enrolled in a workflow or executing an action at the same time, the workflow may be throttled. When a workflow is throttled, actions will not execute immediately, but in a queue as objects are processed. In Center on a date or Center on a date property contact-based workflows, this may cause contacts to miss the first action if it's scheduled shortly after they're enrolled in the workflow. To avoid this, you can enroll your contacts in advance, or schedule the first action at a later time relative to the date or date property. The impact of a new workflow action on objects that are active in the workflow depends on where they are in the workflow relative to the new action. If an object is active in a workflow at a step before the action is added, they will be scheduled for it when they reach that new action in the workflow. If an object is active in a workflow at a step after the action is added, they will not complete the new action. Object A was scheduled for the original first action. They will be scheduled for the new (now second) action after they execute the first action. Object B was scheduled for the original second action. They will not be scheduled for the new action after they execute the original second (now third) action, and will complete the workflow. If the Assign company owner to contact by default setting is enabled, you'll see an alert when you add a Rotate leads action to a contact-based workflow: New contacts will take about 10 minutes to be processed because the contact and company owner sync is enabled. When a new HubSpot contact is created, and ownership is synced between contacts and companies, it may take some time for the contact to be associated with a company, and then for the company's owner to sync to the contact. 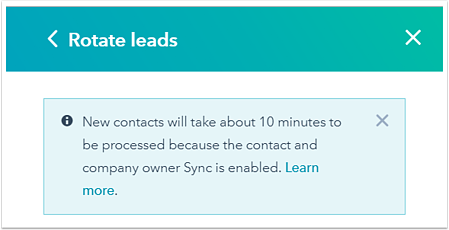 As a result, new contacts will be delayed for 10 minutes before executing the Rotate leads action, to allow sufficient time for the contact-company association to take place and ownership to sync. Only marketing emails that have been saved for automation can be sent in workflows. If a marketing email is a draft or has been previously sent to a list of recipients, it will not appear for selection in the Send email action. Delay is the first action: contacts in the deleted delay will complete the delay as originally scheduled, then proceed through the rest of the workflow. If there are no other delays further down in the workflow, contacts in the deleted delay will complete the delay as originally scheduled, then be unenrolled from the workflow. If there are other delays further down in the workflow, contacts in the deleted delay will complete the delay as originally scheduled, skip the action(s) following the deleted delay, and move to the next delay. When you delete a delay in a company-based, deal-based, ticket-based, or quote-based workflow, objects waiting in the delay will immediately skip the delay, and proceed through the rest of the workflow. Longer delay: the contact will complete the delay as originally scheduled, then be rescheduled for the remainder of the new delay length. For example, if the original delay length is 1 hour, and the new delay length is 2 hours, the contact will first continue to complete the original delay of 1 hour. When the original delay length is complete, the delay will be rescheduled for another 1 hour, for a total of 2 hours. Shorter delay: the contact will complete the delay as originally scheduled. For example, if the original delay length is 2 hours, and the new delay length is 1 hour, the contact will continue to complete the original delay of 2 hours. Longer delay: the object will be rescheduled to complete the remainder of the new delay length. For example, if the original delay length is 1 hour and the new delay length is 2 hours, an object that has already completed 30 minutes of the original delay will be automatically rescheduled to complete the updated delay in another 1 hour and 30 minutes, for a total of 2 hours. Shorter delay: the object will be rescheduled to complete the remainder of the new delay length, or complete the delay immediately if the time that has passed exceeds the new delay length. For example, if the original delay length is 2 hours and the new delay length is 1 hour, an object that has already completed 1 hour and 30 minutes of the original delay will be rescheduled to complete the updated delay immediately.